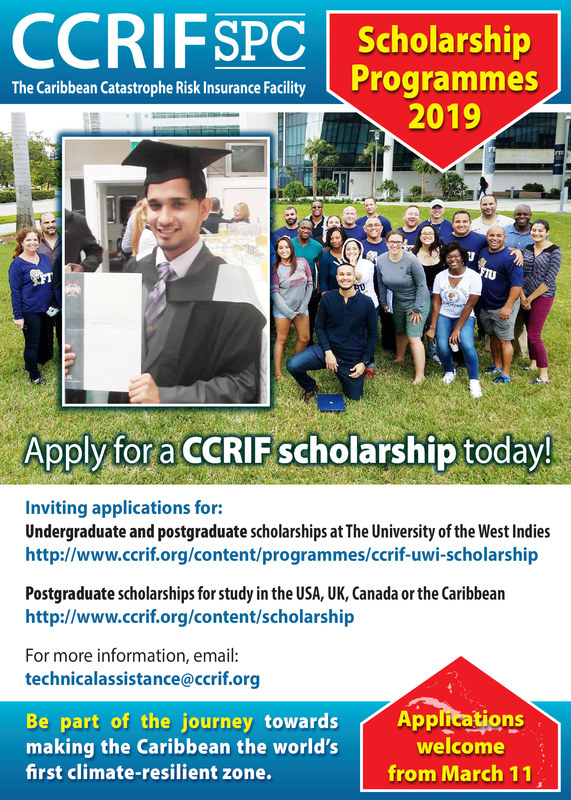 CCRIF is supporting a regional internship programme to provide career-related work experience for CARICOM and/or CCRIF member country citizens that enhances the graduates’ academic training and provides a real world introduction to the graduates in the areas of disaster risk management, climate change, meteorology, risk transfer and/or risk modelling. CCRIF partners with national disaster management and meteorology offices and regional organizations including the Caribbean Disaster and Emergency Management Agency (CDEMA), Caribbean Institute of Meteorology and Hydrology (CIMH), CARICOM Secretariat, Organisation of Eastern Caribbean States and the University of the West Indies (UWI) among others. 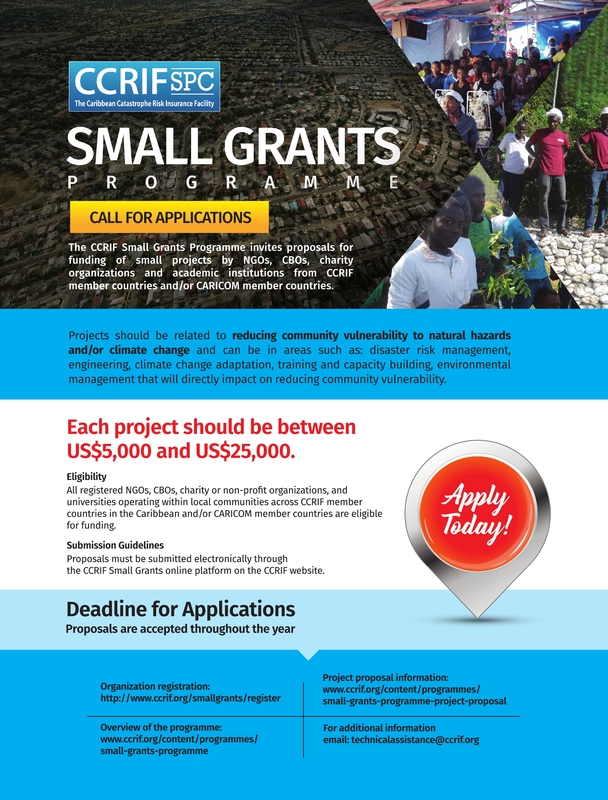 Deadline for applications: June 2, 2019. Interns will be placed at organizations based on the project requirements specified by the host organizations and the qualifications, experience and skills of the applicant. 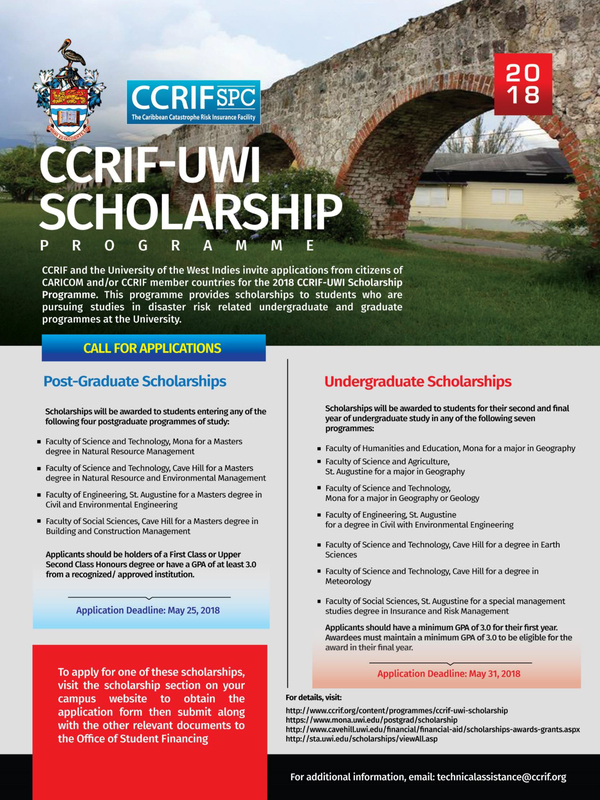 Preference will be given to candidates who are recipients of a CCRIF-UWI Scholarship or a CCRIF Scholarship. Candidates applying must have completed their first degree by the beginning date of the internship. The internship will be for two months, with the understanding that the internship can be extended by mutual agreement between the host organization and intern at no cost to CCRIF SPC. This agreement, if put into force, will need to be communicated to CCRIF. The internship programme will be on a full-time basis. Interns will be expected to work five full days a week in the organization that has been selected for them, under the supervision of an experienced staff member. Accepted interns will be provided with a monthly stipend by CCRIF to cover living expenses. The timeframe for the internship will depend on the requirements of the host organization and normally will be between July and November. Applicants who are placed outside their home country will need to provide proof of health/medical/travel insurance before arrangements can be made for the internship. Accepted interns placed outside their country will be provided with an allowance for accommodation and a return airline ticket between the home country and country of placement..
A complete list of roles and responsibilities for CCRIF SPC, host organizations and interns can be found here. All files to be uploaded should have the applicant's name as the prefix.